Thanks to Fernet Branca I'm celebrating National Chocolate Milkshake Day with a very special ice cream milkshake cocktail. I happen to be a big fan of chocolate shakes, I've loved them since I was a kid and still do, but these days my adult palate really appreciates a shake that's not pure sugar, one that incorporates other tastes for a full range of flavor. A little bitter and a dash of salt can really make a sweet shake sing. This is where the Fernet comes in. Hailing from the Bay Area, I'm a fan of amaros*, in particular Fernet Branca. A Fernet and Coke was my GoTo cocktail for years and is still a trusted standby. Fernet is a bitter digestivo liqueur originally created for medicinal purposes by Bernadino Branca in Milan in 1845. The liqueur is made from a blend of spices, herbs and roots including myrrh, peppermint oil, chamomile, cardamom, and saffron, which are soaked in alcohol, spun in a centrifuge and allowed to settle for a month before being filtered. The Fernet is then aged in Slovenian oak barrels for a year. The final step is to add sugar. Fernet is often called a licorice liqueur but I personally find it a deeper taste experience. I get a whiff of chocolate just before I sip, then the bitter citrus chimes in and finally the saffron and licorice hit my palate. It definitely has that anise flavor but not aggressively, at least for me. 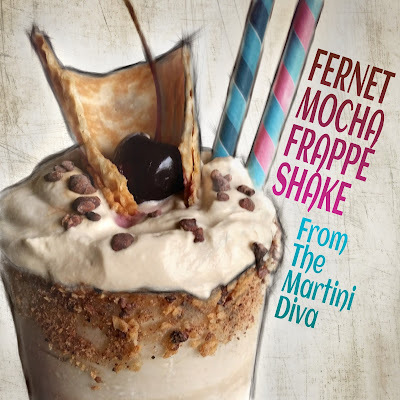 Although I do drink Fernet as a digestivo, I find it particularly appealing as a bitter component to tamp down what might otherwise be overly sweet cocktails. It works much like the application of bitters in that manner but, unlike bitters, brings some additional alcohol, volume and its distinct flavor profile to the party. That's the approach I've used for this adult chocolate milkshake. GARNISH: 1 Large piece of an ice cream waffle cone, crushed waffle cone and crushed cacao nibs for the rim, extra cacao nibs for topping, Bordeaux Maraschino cherry, Scrappy's chocolate bitters. Fill one small plate with the two tablespoons of creme de cacao and one with the crushed waffle cone and crushed chocolate nibs mixture. Dip the rim of your glass in the liqueur and then into the nibs and cone mixture. Add the Fernet-Branca, espresso powder, milk, salt, creme de cacao and then the ice cream to your blender and blend until just smooth and creamy. Don't over blend. Pour into your chilled, rimmed glass, mound on the espresso whipped cream and top off with a few drops of the chocolate bitters. Add the piece of waffle cone then slide the Bordeau Maraschino cherry inside the cone. Slide in a couple of straws and serve with an ice cream spoon. Whip in a chilled stainless steel bowl with chilled beaters in your hand mixer until your whipped cream reaches soft peak. Store covered in the refrigerator for up to 4 hours. 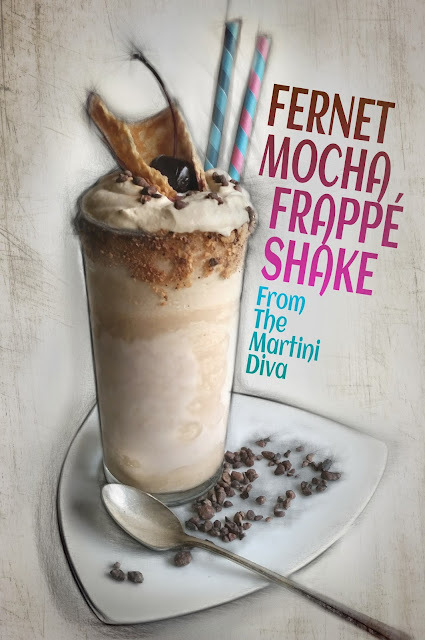 My thanks to Fernet Branca for supplying me with their lovely liqueur and the Whole Foods gift card for supplies so I could create this yummy, boozy shake for Chocolate Milkshake Day. * Amaro, Italian for "bitter", is an herbal liqueur that considered an after-dinner digestif.